During the Italian Renaissance—the period from about 1475 to 1600 that is often seen as the foundation of later European art—drawing became increasingly vital to the artistic process just as it grew dramatically more sophisticated in technique and conception. 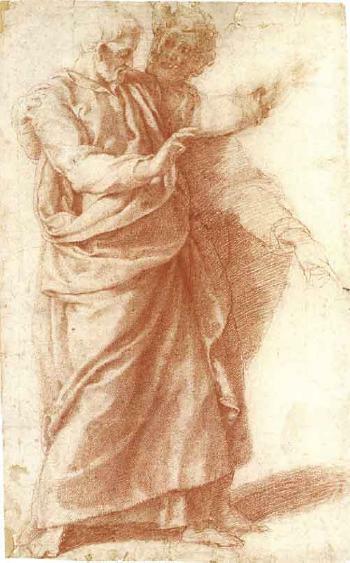 Today, Italian Renaissance drawings are considered some of the most spectacular products of the western tradition. Yet, they often remain shrouded in mystery, their purpose, subjects, and even their makers unknown. Featuring drawings from the Getty Museum’s collection and rarely seen works from private collections, Spectacular Mysteries: Renaissance Drawings Revealed, on view December 11, 2018—April 28, 2019, at the J. Paul Getty Museum, highlights the detective work involved in investigating the mysteries behind master drawings. The practice of drawing flourished in Italy during the Renaissance, due to a surge in patronage for paintings, sculpture, and architecture, which went hand in hand with the rise of artists’ studios and a rigorous production process for these works. Many of the drawings produced at the time tell stories of their creation and the purposes they served, yet sometimes even the most seemingly simple question—who drew it?—is a mystery. Given the ease and informality with which a sketch can be made, its purpose and other information about it must be discovered from the only surviving evidence: the drawing itself. Clues about the artist can be uncovered by comparing a drawing with the stylistic characteristics of other sheets. In 1995, for example, a Sotheby’s expert looked at Study of a Mourning Woman (about 1500-05), and immediately recognized the distinctive penwork and handling of the drapery of Michelangelo. Subsequent study confirmed this attribution. The Getty acquired the drawing in 2017. Inscriptions can sometimes also be a useful clue to the artist, but should be treated with caution since they often reflect the over-optimistic attribution of a past owner. One work in the exhibition – Exodus (about 1540) – features many inscriptions. It took some time and much research to decipher which inscriptions belonged to past owners and which was that of the artist. Eventually, the drawing was attributed to Maturino da Firenze. Mysteries about the sitter, subject, and purpose can sometimes be revealed by linking a drawing to a painting, sculpture, or print. The purpose of Two Male Standing Figures (about 1556) was unknown until 2001 when the work was auctioned and identified as the work of Girolamo Muziano. At that time, it was determined to be a study for figures in an altarpiece the artist painted for the cathedral in Orvieto. St. Francis Kneeling in Ecstasy Before a Crucifix, n.d.
Martyrdom of Saint Sebastian, n.d. Spectacular Mysteries: Renaissance Drawings Revealed will be on view December 11, 2017 –April 28. 2019, at the J. Paul Getty Museum at the Getty Center. The exhibition is curated by Julian Brooks, senior curator in the Department of Drawings.